I’ve teamed up with So Delicious for to bring you a delicious recipe made with my favorite So Delicious Dairy Free Coconut Milk Yogurt. It’s been our favorite and go to dairy free yogurt for years. My oldest daughter and I are excited that Target has been carrying a pretty good selection of So Delicious yogurt. Don’t you love it when your favorites show up there? Right now our store only carries the big tub of So Delicious Plain Unsweetened Coconut Milk Yogurt, which is fine since that’s what I use most of the time. The other big tubs, Vanilla, Plain, and Vanilla Unsweetened we buy at our local Whole Foods. Thanksgiving is just around the corner and while I’m not a fan of many of the traditional foods brought to the feast I love the tradition and getting together with family. It’s no secret that I love cranberries, no this isn’t another cranberry post, so that is one thing I’ll be filling up on for sure. As far as turkey, stuffing, mashed potatoes, or even the traditional pies I’m not a person that gets excited about them. Just being honest and it’s ok my husband is all over the Thanksgiving foods and will eat my share too. While I love sweet potatoes I’ve mentioned I’m not a fan of the traditional sweet potatoes sitting in butter topped with marshmallows. However give me a baked sweet potato stuffed topped with toasty marshmallows, and even some nut butter and I’m there! Or even turning that into something fun like a Sweet Potato Marshmallow Pizza! When it comes to pie I like pumpkin pie, just not the crust. I’ve never been a pie crust fan, every few years I try it again and nope still not a fan. While thinking about how I was going to revamp and whip up a pumpkin pie a few months ago I had a few ideas, yes I was thinking about pumpkin pies at the end of summer because I love pumpkin but than the pumpkin craze came and this is the only year I can ever remember that I wasn’t very excited. One of the ideas that I thought was just genius, not to toot my own horn but I got pretty excited! It involved putting a pumpkin pie and sweet potato pie together, but wait there’s more! Funny thing I can’t ever recall having a sweet potato pie. Well other than Hail Merry Sweet Potato Mini Miracle Tarts. So what’s better than a Sweet Potato Pumpkin Pie? 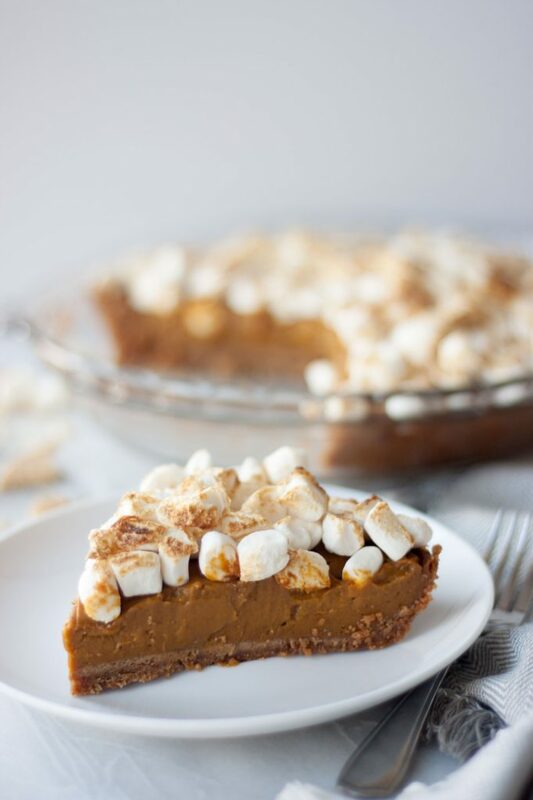 If we’re talking sweet potatoes and Thanksgiving we have to have toasted marshmallows and oh they go so perfect with a graham cracker crust! Recipe testing this one was fun and the whole family was in on helping recipe test. Hey I had to tweak, wanted to try adding the marshmallows at the end of the baking time which didn’t work because they fall and I didn’t care for the texture after chilling it. So we went with toasting them just before serving, not only looks better but tastes better too. Just when I had it S wasn’t thinking the texture was a little too thick and wanted it more pudding so I tweaked it again until I got that “This is AMAZING Mom” moment! 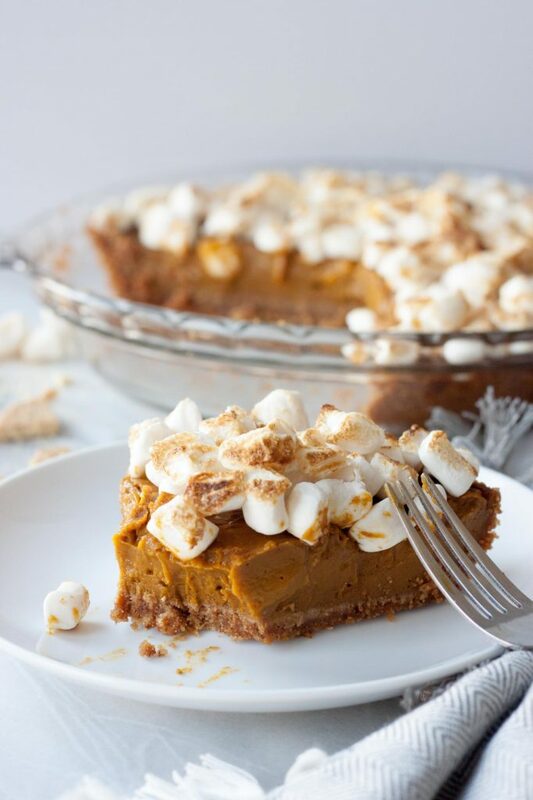 Nothing screams Thanksgiving like pumpkin pie, and sweet potatoes with marshmallows! Preheat oven to 350F. In a bowl mix together the crushed graham crackers, sugar, and butter spread until the mixture is all wet and incorporated. Press crust mixture into a 9″ pie pan, going half way up the sides, set aside. In a Vitamix, or high-speed blender/food processor, blend all the filling ingredients together except the cornstarch until smooth. If you want to mix the pie by hand just make sure you puree your sweet potato or your pie will not be smooth. Lastly blend or mix in the corn starch. Spread filling into your prepared pie crust. Bake for 30 minutes. Allow pie to cool on a cooling rack for about an hour before moving to the refrigerator to chill for at least 2 hours. Just before serving top with marshmallows and toast with a kitchen torch. Enjoy! 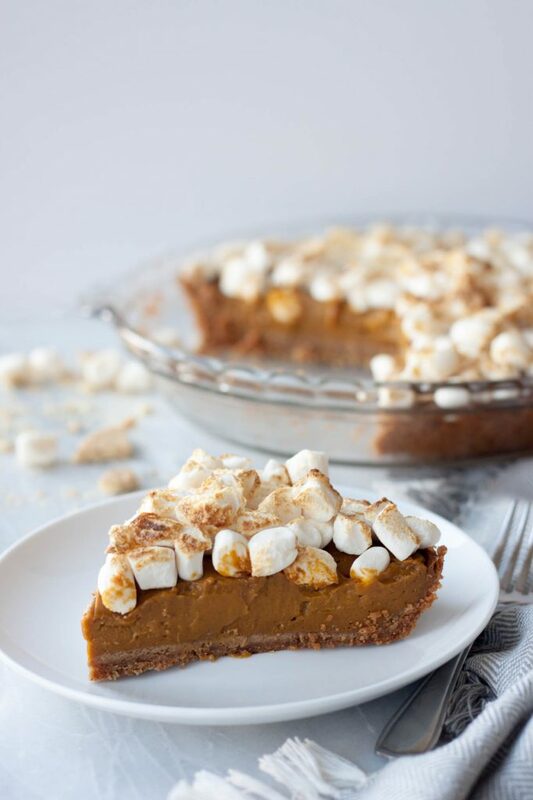 Nothing screams Thanksgiving like Toasted Marshmallow Sweet Potato Pumpkin Pie! It’s Friday so I’m linking up with fellow bloggers Farrah, Annmarie, Esther, and Jess for Foodie Friday! This gets me so excited for Thanksgiving! 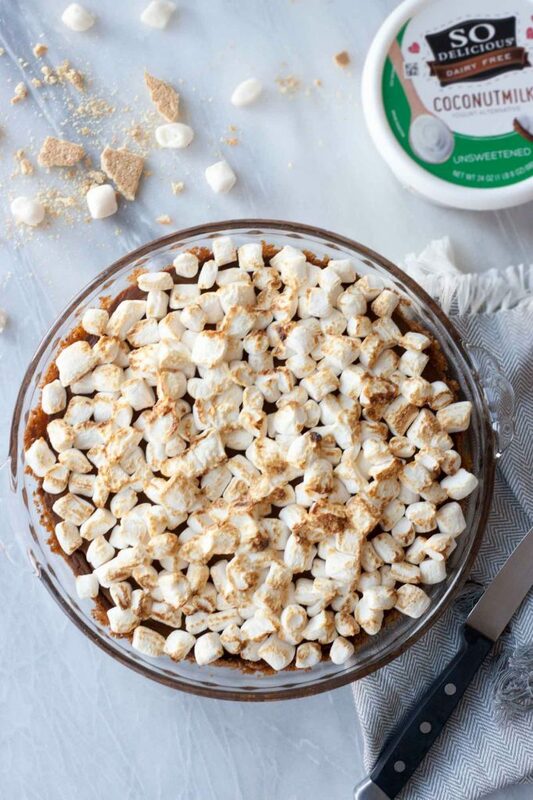 Sweet potato casserole topped with toasty marshmallows is my favorite! It’s right around the corner! I love the combination too but often there is too much butter and extra sugar added and they are sweet enough with the marshmallows, I think. Totally need to make this, looks amazing! All right putting this in my make it for mom file! She would be all over this dish! Oh let me know what she thinks if you do! I love everything about this, definitely making it for Thanksgiving! Thank you. Let me know what you think if you do! I love seeing great dairy-free options are Target now too! And that sweet potato pie…looks delightful. I saw this on your IG and had to come see. YUM! I need this in my life. My weak spot is marshmallows. I will never turn down a s’more and now I’ll never turn down this pie! Haha you’d fit right in this family! im not even a pie person but i’d totally dig in because of all that marshmallow. I love the toasted marshmallow flavor. This looks awesome! Thank you! They really add a different taste and level of fun. 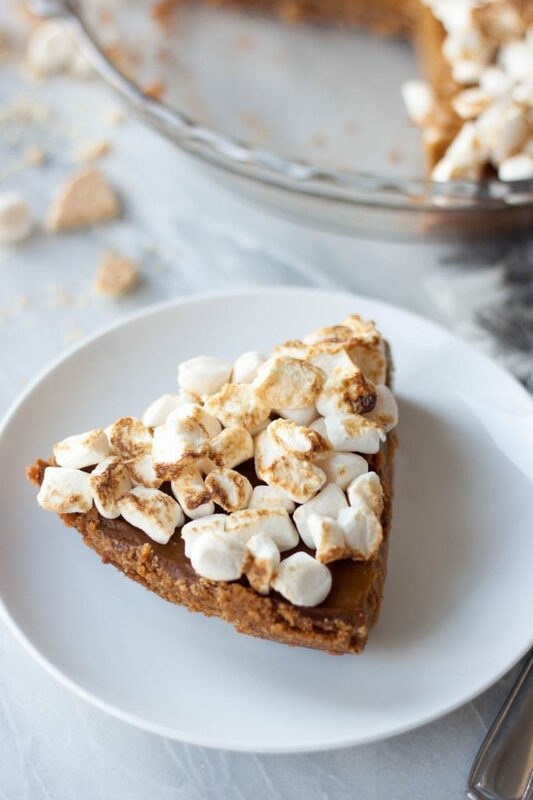 This looks so good… and sweet potato pizza topped with marshmallows? what a great idea! Thank you! Yes I was going to post the recipe but haven’t gotten around and the few times I made it the pictures were hard to get with it being so late and dark out. Holy moly, girl! NEED! Too bad we already had Thanksgiving in Canada but I think this could and should probably be made any ol’ time! Thanks for another fab recipe. Haha I’d come up with any reason to make a good dessert…. umm dogs birthday? Friday, surviving a Monday! Love the toasted marshmallows on top! This pie is a perfect finish to the Thanksgiving meal! I need to make this ASAP, looks amazing. Love this sweet potato pie! Adding the marshmallows is a great idea – that way my kids would love it, too! Pinning! Thank you, oh yes it adds an element of fun kids and us kids at heart can’t resist! I love the marshmallows on top…makes me kinda just want to eat the top! Plus, I’m in love with So Delicious anything! Haha, thank you! So Delicious is a fav in our house! I think this kid-friendly pie is going to speak to allergy-friendly and vegan moms everywhere! It looks so fun and tasty. Alisa Fleming recently posted…Chocolate Pumpkin Tartlet Cupcakes: Vegan & Allergy-Friendly! Thank you Alisa! It’s a great one that everyone can enjoy! My husband loves sweet potato pie and wishes I would make it more often. I love the thought of marshmallows on top–that’s always a great idea! If you make this one for him let me know what he thinks! Pumpkin AND sweet potato? I’m swooning! This looks so great! I am def gonna have to make this dish even if I am not hosting a Thanksgiving meal! Looks so delicious! Might need to add this to our thanksgiving dinner menu! You had me at toasted marshmallows. This reminds me of the sweet potato dishes I grew up eating during Thanksgiving! Dishes that bring back childhood memories are some of my favorites! Can’t go wrong with toasted marshmallows! I love love pumpkin pie but I’ve never tried sweet potato pie. I’ve never tried a traditional sweet potato pie either but I certainly had fun playing with the idea. Wish I was close I’d deliver you dessert. Maybe you can pick up some Hail Merry Tarts? Loving all those marshmallows on time!! I could definitely go for a slice of this pie right now!! I am in serious DROOL MODE right now with this absolutely delicious recipe! I need to find and try sugar-free marshmallows (ha, that sounds like a recipe for stomach disaster) … And I want to pureed the crap out of sweet potatoes and pumpkin and CHOW DOWN!